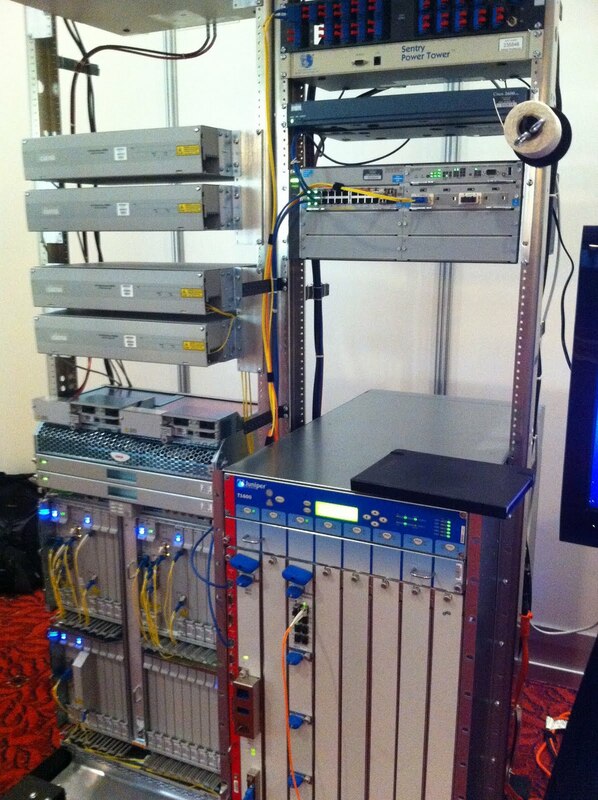 The Internet² Spring Member Meeting started on Monday morning here in Washington D.C. and one of the things they set up is a "typical PoP" or point of presence showing off the new 100Gbps hardware (lower left slot in the Juniper T1600). I believe that this will be the typical equipment setup that you will soon find in one of the gigapops after the upgrade. This particular setup is destined for New York but was rerouted to the meeting to show it off. They also brought a flat screen display with a touch panel in front of it. It is used to graphically display network statistics overlaid on Google Earth. 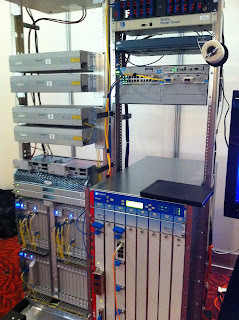 The software was developed by the Global NOC and is a pretty cool setup. There were many very useful presentations on topics such as IPv6, security issues, network updates, K20 networks, regional area network updates, ION, etc. There was even an announcement of the resurrection of the Research Channel at the University of Wisconsin - Madison instead of the University of Washington. We will soon be taking part in an IPTV pilot with all content being distributed via ASM multicast. Time to get our IPv4 multicast infrastructure working and properly monitored. Some questions came up on the future of IPv6 multicast as it is not being used in the R&D networks at all. IPv6 uses link local multicast as a replacement for broadcast but the uptake of inter domain IPv6 multicast has been very slow. This meeting was also an opportunity to meet other colleagues I normally communicate with via email or on audio conferences. We discussed some more campus logistics associated with the upcoming ESCC/Internet² Joint Tech meeting that I'm hosting in Fairbanks this summer. I'm starting to feel stressed out by all of the arrangements and tasks that still need to be done. I head out tomorrow morning with a stop in Corvallis to visit family over the weekend. Dang, Richard, I'm a network geek and some of the tech terms you mentioned had me reaching for google! Neat stuff you're helping to bring about. Woosh! That's the sound of your post rushing past WAY over my head! LOL! I copied and pasted your post into Google Translator and it couldn't decipher your language either. All I know is to expect some new and wonderful things in the tech industry... I think. Either way, keep up the great work we're counting on you! I would have loved to be there and play with this stuff. Sorry about that, I guess I've been working with this stuff way too long.